Working together, SOCIEUX+ and the Ministry of Labor and Employment Promotion (MTPE) of Peru have jointly identified two areas of cooperation for improvements in social protection: the portability of rights of Peruvian labor migrants (Action 2017-12), and adequate coverage of atypical workers (Action 2017-30). SOCIEUX+ technical assistance to address these issues began with missions from EU experts in February 2018. 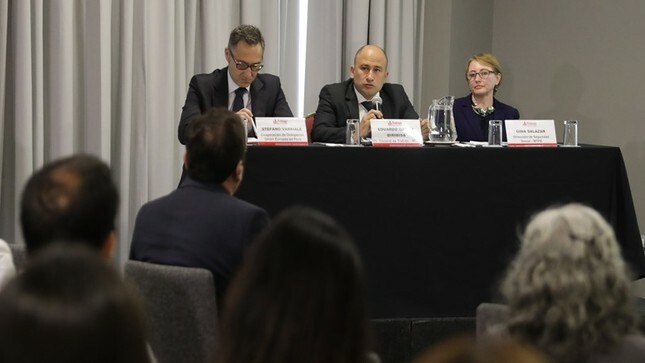 The Labor Migration Directorate of MTPE expressed the desire to enhance its capacity to negotiate and establish bilateral conventions for social rights portability, based on the increasing number of Peruvians working abroad. In the last decades, Peruvian emigration steadily increased, and by 2018 more than 10% of Peruvian nationals were living and working abroad, with more than 100,000 Peruvians residing in the United States, Spain, Argentina, Italy, Chile, Japan, as well as many other countries. In this context, the establishment of bilateral agreements between Peru and these countries is increasingly important since it allows migrant workers to apply overseas work toward access to benefits such as health care, economic benefits, family assistance, etc. SOCIEUX+ technical assistance for migrant labor rights has been planned in two steps, starting with an initial evaluation of current models of bilateral social security agreements applicable to Peruvian international labor migrants, and the development of a reference model based on European and international standards and best practices. The second step is a training seminar where SOCIEUX+ experts will present the social protection systems of countries with the largest number of Peruvian migrant workers, which might be considered by the Peruvian authorities for future discussions on bilateral agreements. The importance of extending social protection coverage to atypical workers (workers in microenterprises, part-time workers, self-employed, and independent workers) in Peru derives from the magnitude of the phenomena. In 2016, only 33% of the 16 million economically active individuals in Peru were covered by any social protection scheme (public or private), leaving more than 10 million people without coverage. Atypical workers constitute the most vulnerable group; more than 75% of these workers lack access to any sort of pension system. In this context, the Social Security Directorate of MTPE has made it a priority to explore innovative ways to extend social protection coverage for health and pensions to these vulnerable groups. Understanding practices for extending social protection coverage will help these decision-makers to enrich the debate on social protection reforms and possibly contribute to a reduction in the number of atypical workers without coverage. SOCIEUX+ 2017-12 and 2017-30 PERU, ACT. 1 (February 2018). Photo courtesy of MTPE, Peru.